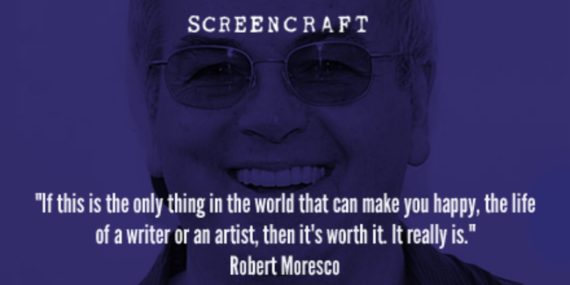 Robert Moresco is a mentor for the third annual ScreenCraft Screenwriting Fellowship. He co-wrote and produced the Oscar-winning film Crash, sharing the Best Original Screenplay prize with Paul Haggis. 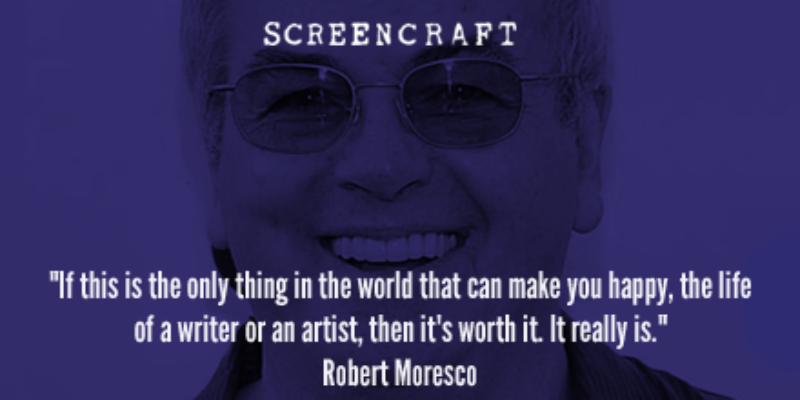 Moresco also received the WGA, BAFTA and, Critic's Choice awards for his work on the screenplay, and the film won additional Oscars for Best Picture and Achievement in Editing. Moresco's other features include, Million Dollar Baby (2005 Academy Award Winner for Best Picture), which he co-produced and developed with Paul Haggis; and 10th and Wolf, his directorial debut starring James Marsden and Giovanni Ribisi. Crash, the film, served as the inspiration for Crash the television series, which aired on Starz. Moresco executive produced the first season, in addition to directing two episodes. The series starred Dennis Hopper, Eric Roberts, Ross McCall, and Jocko Sims, among others. He has also written scripts for the television series EZ Streets, Millennium, and The Black Donnellys. ScreenCraft: When and where did your storytelling roots begin? Robert Moresco: That’s an odd and strange question that I’m not sure anyone can answer. I think I was always interested in storytelling. I remember loving songs that told a story. Teen Angel, Patches, Last Kiss. All of them had a narrative to it that I was drawn to. Of course, I didn’t know that at the time, but I think that was definitely the beginning, which eventually led to other types of storytelling. ScreenCraft: What brought you to screenwriting? Robert Moresco: Playwriting. I had tried making a living as an actor. It didn’t work out too well, and the choice was to find another way to make a living, or stay in this business somehow, and it seemed plausible where I could write my own work, where I didn’t have to depend on someone else to make a living. So I went and tried to learn something about the art of playwriting. That led to the study of philosophy and poetry and screenwriting and lots of other stuff for a lot of years, and eventually I did start writing plays. In 1988, one of those plays was produced in New York and seen by a producer from Warner Brothers who was doing a movie with James Earl Jones. That producer’s name is Norman Twain, a great guy, and we remain friends to this day. The movie never got made, but it allowed me to enter into the world of screenwriting. And when that screenplay was finished, my version of it, lots of Hollywood people read it. Agents, managers, studio executives. And I began a relationship with the world of screenwriting and executives in Hollywood. ScreenCraft: How did you become attached to Crash and what was that experience like collaborating with Paul Haggis? Robert Moresco: Paul and I had been friends and working together since 1995. He hired me on my first television job in the same way Norman Twain hired me for my first screenwriting job. Paul and I have always had a great relationship in that neither one of us has an ego about anything other than finding the next best piece of work. So we just naturally went from working in television together to trying to make movies. Paul had an idea for Crash. He had written some characters and some outlines. He asked me if I wanted to get involved. I did, and we wrote the spec script for Crash together. It didn’t take long for the actual writing of the script, but we spent months, just sitting, talking, reading books, talking to our friends of different ethnicities, trying to understand the world. Then one day we said, “Let’s write it.” And we did. We had also worked on Million Dollar Baby together right before that. That was fun. Working with Paul is always fun. He’s committed to doing good work. Nothing else matters when you’re in a room with Paul, and that’s always exciting. ScreenCraft: What was the Oscar experience like as a screenwriter and winner? Robert Moresco: Oh, I don’t know. Surreal I guess, is the word. You don’t believe you’ll ever get nominated, then you get nominated and you don’t really believe you’ll win. Then when you win you don’t really believe you’re better than any of the other guys who were nominated. I guess surreal is the word; you bask in it for a little while, thinking you’re better than you really are. Then you go back to work. ScreenCraft: What is it like collaborating with Clint Eastwood? Robert Moresco: Clint was shooting Million Dollar Baby at the same time we were shooting Crash, so we never spent a lot of time together, Clint and I. But I really like him. Like Paul, he’s committed to good work. Like a lot of wonderful filmmakers, the commitment is the essence of what we’re after. And Clint is one of those committed guys. But more than that, genial, nice, good guy. Clint Eastwood is a good guy. That’s what I’ve taken away from working with him. ScreenCraft: What lessons or experiences early in your career changed your writing for the better? Robert Moresco: There are too many, and all of them are personal. You learn a lot about the craft of screenwriting from people you admire. You study them. I said a little while ago that I spent four or five years reading books about the philosophy of writers, and the craft is what you learn from that. But what you don’t learn is who you are as a writer, who you are first as a human being, from books. You find that out yourself, from your own personal experiences. When it works really well, this writing thing, is when you draw on your own experiences, and marry it to what craft you’ve learned. ScreenCraft: How has the film industry changed for screenwriters since the 90s and early 2000s? Robert Moresco: The whole world is talking about that now. To ask me to add to it? I don’t know how or why. But I will say digital has changed everything. Big tent pole filmmaking has changed everything. I grew up in television after theater. So one can say my toddler years were in playwriting, my teen years in television, then my adult years in movies. Now I’m back in television. Why? Because today it’s easier to get the things you care about done on TV than in filmmaking, because of the big tent pole productions in the film world. But I’m not the first to say that. It’s just obvious. ScreenCraft: What is your own writing process like as a screenwriter? Robert Moresco: Lay awake at night, scream. Lay awake at night, scream some more. Lay awake some more, scream some more. Beat yourself up, convince yourself that you’re worthless, then keep doing it until you find something worth writing in the next scene, or the next paragraph, or the next line of dialogue. We all think we’re worthless. Who knows why? Maybe it’s because we’re putting our souls on the line for other people to judge. But the commitment to the next scene, the next page, the next piece of dialogue, that’s what writers do. We go and live in our own world and we stay in that world until something comes. And that something is the beginning. ScreenCraft: What advice do you have for novice screenwriters looking to make their screenwriting dreams come true? Robert Moresco: Know that there’s no golden rule. There’s no pot of gold at the end of the rainbow. There’s only the journey. And if the writer’s journey is for you, you’ll know it. You’ll know it because you won’t quit. I have two daughters who are both in the business. What I said to them is what I would say to anybody trying to get in the business. What we do is really, really hard. Hard to do and hard to get it done. So if there’s something else you can do and be happy, go do that. Because this is too hard. But if this is the only thing in the world that can make you happy, the life of a writer or an artist, then it’s worth it. It really is. ScreenCraft: What upcoming projects are you currently working on? Robert Moresco: There’s a bunch. You’re always working on a couple of things. One of the most exciting ones I’m doing is adapting the William Friedkin movie To Live and Die in LA into a television series. Billy and I created a story for television together. I’m writing and Billy is directing. The network is WGN, the studio is MGM, and it’s tremendously exciting. There are many others. I’m producing a couple of things, there’s a spec script I’m attached to direct. Far too much to get into. I guess the main answer to this question is I don’t know anyone who makes a living in Hollywood that is attached to just one thing. We all have ten, twelve, fifteen pieces, and you work simultaneously on all of them until one breaks through, then that one takes focus. You get that one done and then another one takes focus. ScreenCraft: What's your dream project? Robert Moresco: There’s something I’m working on about the Johnstown flood and the mythic heroes of the West, like Casey Jones and John Henry and people like that. It’s a big, incredible, tent pole movie, which I just said has changed Hollywood. Why am I doing it? Because I’ve never done it. I probably can’t do it, but it’s been in my mind for fifteen years and I keep coming back to it. I’ve recently restructured the entire movie on spec, and I believe I’m writing Act 2 as we speak, every chance I get away from the project that has my focus now. ScreenCraft: What types of stories do you respond to most? Robert Moresco: Anything that has great characters and great dialogue and some story that involves a surprising twist on the human condition. And if it’s funny, that’s a great thing. Even if it’s a horror story, if there’s humor in it? We all find humor in anything we can. It’s what gets us through the next bad moment. ScreenCraft: What are you looking for in the screenplays for the ScreenCraft Screenwriting Fellowship? Robert Moresco: What I’m looking for is an opening to a movie that makes me want to know what happens next, because the essence of screenwriting is the question: Do you want to know what happens next? So I’m hoping for an opening scene that makes me want to read the second scene. And by virtue of the craft and artistry on the second scene, I hope it wants to make me read the third scene. And so on and so on. The deadline for the ScreenCraft Screenwriting Fellowship is December 30th, 2015. The chosen recipients will receive ongoing professional support and a special trip to Los Angeles for meetings and introductions to key entertainment executives, producers and representatives. Apply now and join a growing community of visionary screenwriters with meaningful connections to Hollywood mentors. Past ScreenCraft Fellowship winners have optioned their projects and signed with top representatives at 3Arts, Anonymous Content, Paradigm Talent Agency, ICM, Bellevue Productions and more.